Incognito Mode is Google Chrome's private browsing mode. When you load websites in Incognito Mode, session data that is stored locally is not stored. In other words, Chrome does not save data to the browsing history, cache, or cookie storage among others. Incognite Mode offers several advantages besides that: extensions are not enabled by default in the mode which blocks potential data leaks and sites handle Incognito Mode independently from the rest of the browser. If you are signed in to your Facebook, Google, or Twitter account in the normal browsing session, you are not signed in when you open the same site in Incognito Mode. Great for making sure that activity cannot be linked to accounts but also to sign in to another account without interfering with the session of the first. Google Chrome does not include options to always open certain sites in Incognito Mode. You can install extensions, however, to add the functionality. Hidden: Auto Incognito Filter -- Last updated in 2016. Add sites to a filter list to enforce the opening of these sites in Incognito Mode. Incognito Filter -- last updated in 2013 but it works. Use it to add any website to a list maintained by the extension. All sites on the list are opened in Incognito Mode automatically. Incognito Regex Fixed -- last updated in 2013 but it works just fine. Add patterns, e.g. *.google.com, to always open any google.com domain in Incognito Mode. All extensions have in common that they use filter lists to determine whether a site needs to be opened in the browser's Incognito Mode. Sites that are on the filter list are launched in Incognito Mode regardless of how they are opened. You can type the address and hit the Enter-key in the address bar or click on a link that points to the site: the site gets opened in Incognito Mode regardless. It needs to be noted that the extensions reveal which sites get always opened in Incognito Mode. While that is not a problem if you are the only user with access to the particular account on the computer or device you are using, it may reveal information if that is not the case. Should you use a browser extension to always load specific sites in Chrome's private browsing mode? I have to admit that I prefer a different solution. Instead of using a browser extension, I prefer to use a different browser (or profile) to separate tasks. While that may be a tad less comfortable than using a single instance, the end result, that you work with multiple windows, is the same. Now You: Do you use private browsing modes? Find out how to always load specific sites in Chrome's Incognito Mode to separate them from open sites and improve privacy. 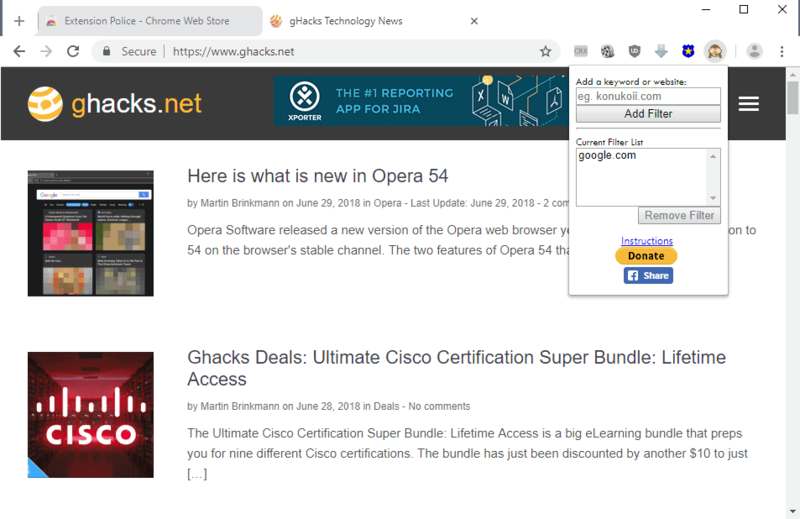 Hi Martin, in cnet now exist a article about the private browsing in Chrome and Firefox is exploitable by hackers, can you see it and talking about? Also, the report that Cnet is linking to, is from August 2009. Either they have linked the wrong report, or have rehashed a story from last year. Thanks for the quick reply, I was a little concern about that. The article was rather lurid, do not you think. For some reason, after I close the Incognito Mode in Chrome on Linux and check the cookies, the cookies from the sites I visited are still there. Does anyone else have this problem? Or an idea what the cause could be? I’m using just a few extensions as it’s not my main browser, could an extension be the cause? Something else? I have this problem with Firefox. It is set to always use incognito, I use this browser for general web browsing, without logging in, etc. However, every now and then it keeps some cookies. CCleaner detects them and if I open the cookie manager in Fx I see them there too. Fairly sure it is not supposed to do that. Ha! Trusting a proprietary app to keep your secrets? Look, Incognito Mode only does so much. Were you to really enjoy such a mode which goes even further, try the Tor Browser Bundle and/or Tails Linux OS.